Social networking sites such as Facebook and LinkedIn are some of the most powerful tools available to recruiters today. As usage continues to skyrocket, more businesses are recognizing the fact that high quality candidates can be reached faster and at lower cost using social networks than traditional recruiting methods. 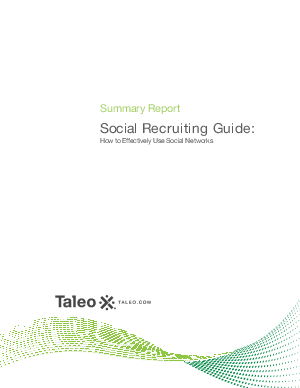 This summary report explains how social networks can give recruiters a competitive edge in locating and engaging the best candidates available to reach your recruiting objectives.